Genuine Mercedes Benz Airbag Ring - A2034600149 . PASSENGER ROOF AIR BAG. DO NOT RELY ON THE LIST TO CONFIRM COMPATIBILITY WITH YOUR VEHICLE. WHEREVER POSSIBLE, WE PROVIDE PART NUMBERS WHICH SHOULD MATCH WITH YOUR ORIGINAL PART. PICK UP FROM WEST MIDLANDS B74 IS ALSO AVAILABLE DURING NORMAL OPENING HOURS. If you would prefer to collect this item, then that option is also available. If the item is found to be tampered with in any way, the warranty will not be valid. B CLASS W246 2011-2015 (not Facelift). E Class W212 FaceLift 2012-2016. GLK 2012-2015. GLA (not FaceLift). CLA 2012-2015 (not FaceLift). Supports W220, W163, W210, W203, W168, W638, W639 & more 2000-2005 year models. If your car is W168 TRW Airbag unit this is not supported by this unit. PAIR OF FRONT SEATBELTS. AIRBAG KIT / SET. -PASSENGER DASHBOARD AIRBAG. -DRIVER AIRBAG. KIT INCLUDE We are unable to cover any labour costs. In the event that a part is supplied and proven to be incorrect or faulty, Usedcarparts must be notified within 48 hours. SUITABLE FOR RIGHT HAND DRIVE CARS ONLY. VERY GOOD CONDITION READY TO FIT. PAIR OF FRONT SEATBELTS. -DRIVER SIDE KNEE AIRBAG. AIRBAG KIT / SET. -PASSENGER DASHBOARD AIRBAG. -DRIVER AIRBAG. All parts are stamped & removal of the marks will invalidate your warranty. We are unable to cover any labour costs. Part number: FITS W212 W204 W246 W207 CLA GLK GLA. The best way to solve any problem is by communicating. BARE AMG E63 LEATHER DASHBOARD. -PASSENGER DASHBOARD AIRBAG. AIRBAG KIT / SET. -DRIVER AIRBAG. -DRIVER SIDE KNEE AIRBAG. KIT INCLUDE We are unable to cover any labour costs. In the event that a part is supplied and proven to be incorrect or faulty, Usedcarparts must be notified within 48 hours. Seat Occupancy Mat/Pad Sensor Emulator. 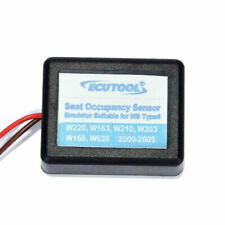 Plug & Play Seat Occupancy Mat Sensor Emulator. 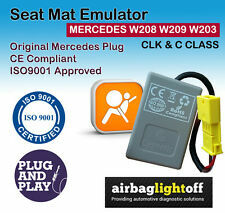 Seat Mat Emulator is designed as a quality alternative to bypass faulty seat occupancy mat/pad sensor and turn off the airbag light. BARE AMG RED LEATHER DASHBOARD. -PASSENGER DASHBOARD AIRBAG. We are unable to cover any labour costs. AIRBAG KIT / SET. In the event that a part is supplied and proven to be incorrect or faulty, Usedcarparts must be notified within 48 hours. Airbag Stitching. Step 1 | Confirm Compatibility. Step 2 | Place Order. Read the "Important" section bellow before buying. Step 3 | Relax & Wait. Part Number. We do NOT send until we confirm compatibility. PAIR OF FRONT SEATBELTS. -PASSENGER DASHBOARD AIRBAG. -DRIVER SIDE KNEE AIRBAG. We are unable to cover any labour costs. -BARE DASHBOARD. AIRBAG KIT / SET. -DRIVER AIRBAG ( OPTION 1 OF 3 ). In the event that a part is supplied and proven to be incorrect or faulty, Usedcarparts must be notified within 48 hours. PAIR OF FRONT SEATBELTS (( RECONDITION SERVICE ) ). -PASSENGER DASHBOARD AIRBAG. We are unable to cover any labour costs. -BARE LEATHER DASHBOARD. AIRBAG KIT / SET. -DRIVER AIRBAG ( OPTION 1 OF 3 ). PAIR OF FRONT SEATBELTS. -PASSENGER DASHBOARD AIRBAG. -BARE AMG LEATHER DASHBOARD. AIRBAG KIT / SET. -DRIVER AIRBAG. -DRIVER SIDE KNEE AIRBAG. KIT INCLUDE We are unable to cover any labour costs. PASSENGER DASHBOARD AIRBAG. -BARE DASHBOARD. AIRBAG KIT / SET. -DRIVER AIRBAG ( OPTION 1 OF 2 ). -DRIVER SIDE KNEE AIRBAG. KIT INCLUDE We are unable to cover any labour costs. In the event that a part is supplied and proven to be incorrect or faulty, Usedcarparts must be notified within 48 hours. You will receive: Dashboard, Passenger Airbag, Passenger front Seat Belt and Knee Airbag. Genuine & Quality Parts. C238 (2016-). W205 (2014-);. C218 (2014-);. These are actual photos of the item you will receive. PASSENGER DASHBOARD AIRBAG. We are unable to cover any labour costs. -BARE DASHBOARD. AIRBAG KIT / SET. In the event that a part is supplied and proven to be incorrect or faulty, Usedcarparts must be notified within 48 hours. PAIR OF FRONT SEATBELTS. -PASSENGER DASHBOARD AIRBAG. -BARE AMG LEATHER RED STICHED DASHBOARD. AIRBAG KIT / SET. -DRIVER AIRBAG ( OPTION 1 OF 2 ). -DRIVER SIDE KNEE AIRBAG. KIT INCLUDE We are unable to cover any labour costs. PAIR OF FRONT SEATBELTS. -PASSENGER DASHBOARD AIRBAG. We are unable to cover any labour costs. -DRIVER SIDE KNEE AIRBAG. -BARE DASHBOARD. AIRBAG KIT / SET. In the event that a part is supplied and proven to be incorrect or faulty, Usedcarparts must be notified within 48 hours. SUITABLE FOR RIGHT HAND DRIVE CARS ONLY. TRANSMISSION 7 SP AUTO DUAL CLUTCH. INTERIOR TRIM LEATHER BLACK 801A. PAINT COLOR MOUNTAIN GRAY 787U. PART REMOVED FROM. MILEAGE N/A. PAIR OF FRONT SEATBELTS. -PASSENGER DASHBOARD AIRBAG. We are unable to cover any labour costs. -BARE DASHBOARD. AIRBAG KIT / SET. In the event that a part is supplied and proven to be incorrect or faulty, Usedcarparts must be notified within 48 hours. PAIR OF FRONT SEATBELTS. -PASSENGER DASHBOARD AIRBAG. -DRIVER SIDE KNEE AIRBAG. -BARE DASHBOARD. AIRBAG KIT / SET. -DRIVER AIRBAG. KIT INCLUDE We are unable to cover any labour costs. 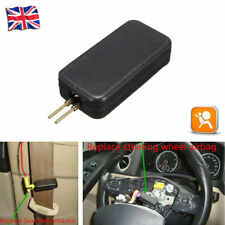 The airbag kit includes: bare dashboard, drivers airbag, passengers airbag, seatbelt tensioners and airbag modules. Model: E350. Body Style: Coupe. Year: 2010. Fuel Type: Diesel. Engine Size: 2987cc. In the event that an item is supplied and proven to be incorrect or faulty, Parts City Ltd must be notified within 48 hours. 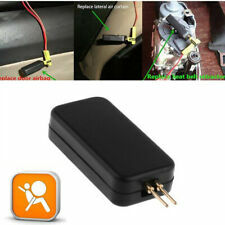 THE AIRBAG KIT INCLUDES BARE DASHBOARD DRIVER'S AIRBAG, PASSENGER'S AIRBAG, SEATBELT TENSIONERS AND AIRBAG MODULE. We provide a wider range of quality vehicle salvage, salvage car parts & used vehicle parts. This has been removed from a 2016 model. Our reference for this part is KIT549 This kit comes with: Dash Board Drivers Airbag Passengers Airbag Airbag Ecu Drivers & Passengers Seat Belts A VAT invoice will be provided for the buyer. All parts come with a 30 day warranty unless otherwise stated. Postage is to the UK mainland only. Thanks for viewing!. S 400 S class W222 (2017-2018). S class C217 (2014-2016). These are actual photos of the item you will receive Part number: A00086087007J20. BARE DASHBOARD, DRIVER'S (STEERING) AIRBAG, PASSENGER'S AIRBAG, 2X FRONT SEAT BELTS WITH PRETENSIONERS & AIRBAG ECU MODULE. THE COMPLETE AIRBAG KIT INCLUDES THE FOLLOWING PARTS We provide a wider range of quality vehicle salvage, salvage car parts & used vehicle parts. 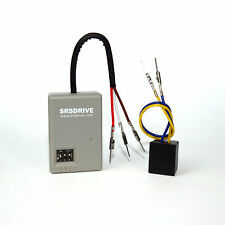 Brand New Genuine Mercedes Benz Sensor A2128210351. Condition is New. Dispatched with Royal Mail Signed For® 1st Class Letter. Support W220, W163, W210, W203, W168, W638, W639 & more 2000-2005 year modles. If your car is W168 TRW Airbag unit, the Type 6 Emulator could not support! Part number -OEM A2058600302. Model - C CLASS SALOON, ESTATE, COUPE W205. Year of Manufacture - 2016. Active airbag light caused by defective passenger seat occupancy mat sensor?. Installing sport seats?. This part is what you need. Seat occupancy status - occupied. Bypass module should not be used when a child seat is to be fitted to the front passenger seat. Suitable For Selected W168 A-Class Models From Chassis J166155 and Build Date 04/04/1999. Most parts sold by us are auto salvage and second hand and sold as such. Most parts. PAIR OF FRONT SEATBELTS. -PASSENGER DASHBOARD AIRBAG. We are unable to cover any labour costs. -BARE DASHBOARD. AIRBAG KIT / SET. -DRIVER AIRBAG. -DRIVER SIDE KNEE AIRBAG. In the event that a part is supplied and proven to be incorrect or faulty, Usedcarparts must be notified within 48 hours. PAIR OF FRONT SEATBELTS. -BARE AMG LEATHER DASHBOARD. -PASSENGER DASHBOARD AIRBAG. We are unable to cover any labour costs. AIRBAG KIT / SET. In the event that a part is supplied and proven to be incorrect or faulty, Usedcarparts must be notified within 48 hours. Collection is available from Manor Auto Salvage Bristol BS2 0SQ. Your understanding and patience will be highly appreciated. However all marks considered bigger than normal wear will be listed. USED IN GOOD CONDITION.